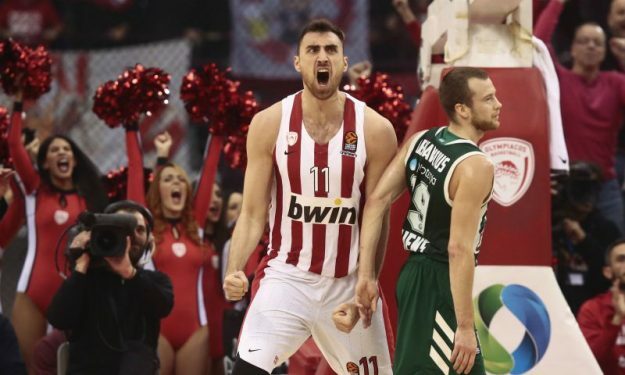 Olympiacos beat archrival Panathinaikos for the first time this season thanks to a powerful defensive effort and a mighty Nikola Milutinov. Nikola Milutinov scored 18 points and grabbed a franchise-record 18 rebounds (surpassing Dino Radja’s 17) for a career-high 41 PIR, as Olympiacos won the EuroLeague version of the “derby of the eternal rivals” vs. Panathinaikos 79 – 65. The Reds improved their record to 10 – 6 and remained at the fourth top of the standings. Meanwhile, Panathinaikos dropped to 7 – 9 and stayed below the playoff zone. Olympiacos established a steady lead from the first period thanks to Milutinov imposing his will inside the paint with points and rebounding, but truly began gaining a major grip on the game in the second period. With the score, 26 – 21, David Blatt’s players pulled off some key stops vs. the offensively lackluster (and without Keith Langford) Panathinaikos and scored multiple buckets on the other end to go up by 15, 36 – 21. With players like Janis Strelnieks (2/2 triples and eight points in the second period, 18 points overall) and Nigel Williams-Goss (7 points, all in the second quarter, plus five assists) entering the offensive equation and thanks to a diverse, two-way contribution by Kostas Papanikolaou (12 points, five rebounds, four steals, three assists), the hosts preserved that advantage until the break (41 – 25). Panathinaikos suffered to make a shot from beyond the arc, finishing the first half with 2/15 and with Nick Calathes out of sync, didn’t have any reliable offensive solutions. Things didn’t change much for the visiting squad after halftime while Olympiacos continued in the same tempo to even gain a 20-point lead via a bucket by Strelnieks. Olympiacos retained a steady control in the fourth period. It was Lukas Lekavicius (10 points) that tried to make Panathinaikos competitive again with seven points in a row that led to his team reducing the deficit to 65 – 52 following Calathes’ first 3-pointer after four missed attempts. But then, Giorgos Printezis slammed the ball following a pass by Williams-Goss to make it 67 – 52 with less than five minutes remaining. PAO remained scoreless while on the other end, Milutinov scored a couple of free throws and Papanikolaou fired a 3-pointer that put his team ahead by 21, 73 – 52. There was no turning back from that margin. Calathes scored a team-high 13 points and dished out seven assists for Panathinaikos but was a non-factor for the most part of the match.